Rugby could soon be ushering in a new way to train, with a revolutionary invention making a big move in America. The MVP – or Mobile Virtual Player – bills itself as “the first ever self-righting mobile training device”, but in layman’s terms, it looks to be the first motorised tackle bag. Controlled remotely and powered by a motor, the MVP simulates an attacking player, being able to move at high speed and change direction. 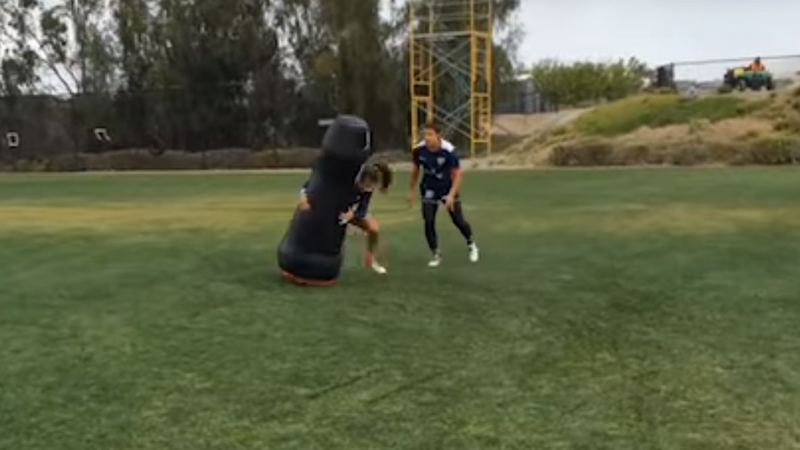 It provides a moving object to tackle, rather than a stationary bag, and can improve tackling technique without the fatigue and injury concerns which come with regular training. The MVP can shift, with a 40m time of around five seconds. Crucially, it enables you to practice tackling in a safer way and eliminate the repetitive impact and fatigue associated with player-on-player contact. It has uses in several areas, able to also be used as a rush defender or kick-chaser to put players under simulated game pressure, as seen below. The technology was developed at Dartmouth College, an Ivy League research university in Hanover, New Hampshire. The technology was initially developed for the NFL, but rugby teams in the USA have used it, including the USA men’s and women’s sevens teams. The MVP, that retails for just over US$800 ($1,086), has also been taken up by club sides in the States.